. The book is a compilation of all deaths known to have occurred within Grand Canyon, and its narrative style does an excellent job of not only explaining how tragic situations unfold, but also how they could have been (and can be) avoided. Dan Hopkins, a writer for FiveThirtyEight, recently analyzed some of the data reported in the book. In a previous incarnation, FiveThirtyEight was a website devoted mostly to polling data and poll aggregation. It now reports on a variety of topics that can be subject to statistical analysis. 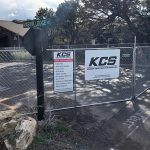 In his article, Hopkins examines the month-by-month breakdown of fatality statistics and attempts to account for a dip in fatalities during July, the park’s busiest month. Monthly permitted user-nights in Grand Canyon National Park’s backcountry, 2009. In July, when there are fewer park fatalities than in June or August, the backcountry sees diminished overnight use. The above chart shows the number of “backcountry user-nights” per month. In other words, it shows the total number of nights spent in the backcountry by all users. (For example, a group of five hikers on a two-night trip would represent ten user-nights.) This data is based on permits issued by National Park Service, so it excludes day hikers. If accurate monthly data on day hiking usage existed, I suspect that it would exhibit a similar but less dramatic pattern. At any rate, the drop in summer usage is really quite dramatic. It gets hot in the inner canyon during the summer. The personal risk of heat-related illness or death generally increases with temperature. However, most backpackers schedule their trips to coincide with better weather conditions. The summer dip in weather-related deaths coincides with the summer dip in backcountry use. 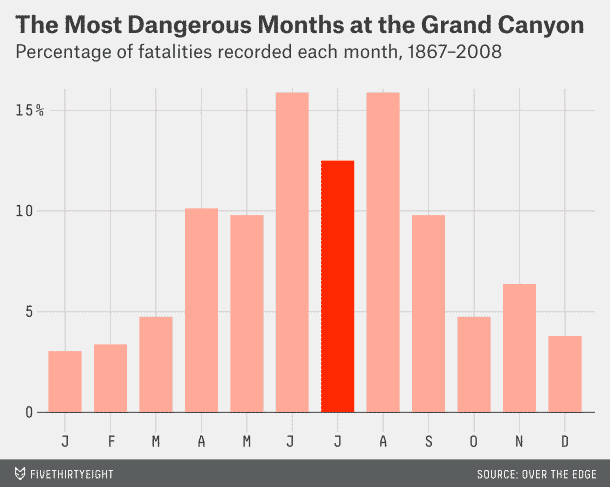 The hot summer months of July and August have seen fewer deaths than May and June. 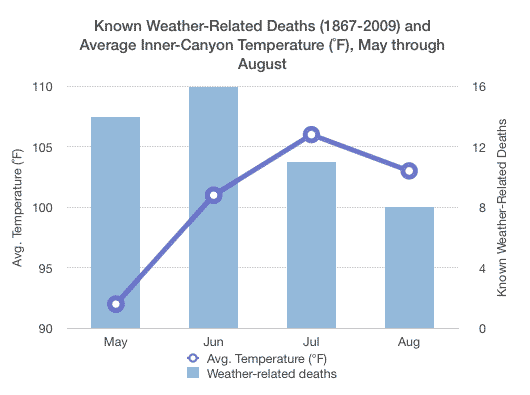 The aggregate number of monthly weather-related deaths is not well-correlated with the average inner-canyon temperature. As the temperature rises, individual hikers are at greater risk of heat-related illness and death. However, backcountry usage decreases during the warmer months. 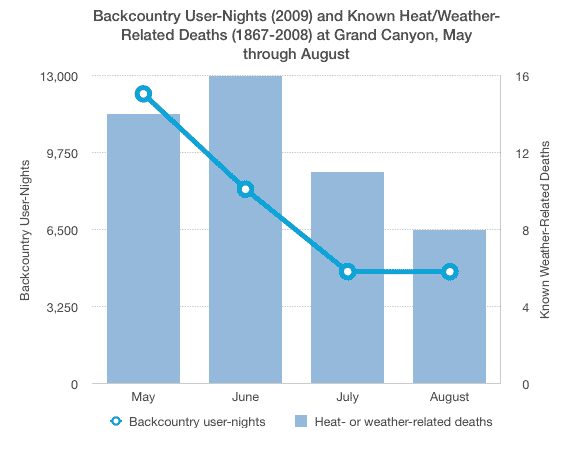 July and August have fewer backcountry user-nights, and fewer heat- and weather-related deaths than May and June. For reasons that are not clear to me, August has more total non-aviation-related deaths than does July. I haven’t done a complete breakdown of the reporting in Over the Edge, so I can’t confidently speculate on why that might be. However, I do think that Hopkins’ initial hypothesis is on the right track. The summer heat may not dissuade foolhardy visitors from pushing their limits once they’re already in the canyon, but it does have an effect on overall backcountry visitation. I see a few take-home lessons in these numbers. Secondly, it’s sobering to see how many weather-related deaths happen in late spring. Hikers should be wary of the false sense of security that may accompany an hour or two of nice weather in the morning. 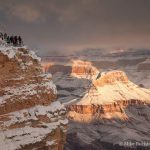 Finally, it’s important to note that the weather and environment at Grand Canyon pose risks all year long. Hikers should take seasonally appropriate measures to minimize risk. Start off by reading, understanding, and following the “Hike Smart” guidelines published by National Park Service.